No doubt, part of its heroic stature derives from its namesake, the outspoken Gen. Billy Mitchell who proved once and for all that bombers could destroy targets, and that wars would nevermore be decided only on land or sea. Under the leadership of Lieutenant General George C. Kenney, B-25 airplanes of the Fifth and Thirteenth Air Forces devastated Japanese targets in the Southwest Pacific Theater (SWPA) from 1942 to 1945, and played a significant role in pushing the Japanese back to their home islands. By the end of World War Two, North American Aviation had built a total of 9,816 B-25 bombers at its California and Kansas plants. Below are two World War II videos featuring the B-25 bomber. The first is a video of the start of the Doolittle Raid on Tokyo in WWII. The B-25 airplanes are shown taking off from the USS Hornet. U.S. Army Air Forces B-25 Mitchell bombers take off from USS Hornet (CV-8) in the Pacific for raid on Japan during World War II. A film based on mission of USS Hornet (CV-8) in Pacific Ocean during World War II. On 18th April, 1942 USS Hornet CV-8 underway with 16 U.S. Army Air Forces WWII B-25 airplanes parked on flight deck to carry out Doolittle Raid on Japan. U.S. Army Air Forces Lieutenant Colonel James Doolittle, leader of the raiding force, wires a Japanese medal to a 500-pound bomb, during ceremonies on the flight deck. The B-25s are prepared for takeoff. The B-25s take off from flight deck. USN (United States Navy) Fleet Admiral William Halsey on the deck of USS Hornet (CV-8) looks up at B-25 in flight. United States 7th Air Force B-25 Mitchell bombers destroy Japanese targets on islands in the Pacific in World War II. U.S. Army Air Forces operations in Pacific theater during World War 2. Animation shows locations of U.S. 13th Air Force on New Caledonia and U.S. 5th Air Force on Australia. Map shows Hawaii. Main gate at Hickam Air Force Base in Honolulu. U.S. 7th Air Force B-17 Flying Fortress aircraft takes off from Hickam AFB. Animation shows the flight of bombers. Jeeps along a jungle highway. Sign on tree reads ‘Ohare Field’. Gun crew clean machine guns. 75 mm canon in nose of a U.S. Army Air Forces B-25 being cleaned by ground crew. B-25 takes off from Coral airstrip. B-25s in formation. B-25s in flight firing cannons. B-25s strafing Japanese airfields. 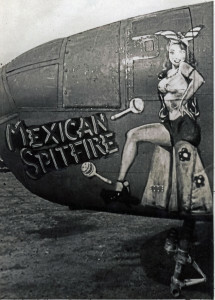 “Mexican Spitfire” is an example of B-25 nose art photos Dad took. The rear view of a B-25 Mitchell bomber in WW2. “Hung Lo,” the B-25 bomber piloted by my father’s friend from Opelousas, LA. My father had a childhood friend by the name of Jack Voitier from Opelousas, LA, USA. 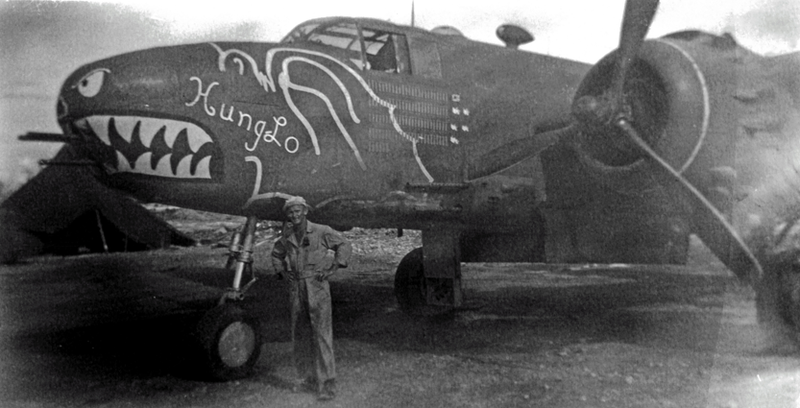 Jack was the pilot of “Hung Lo,” which was a B-25 bomber airplane in WWII. 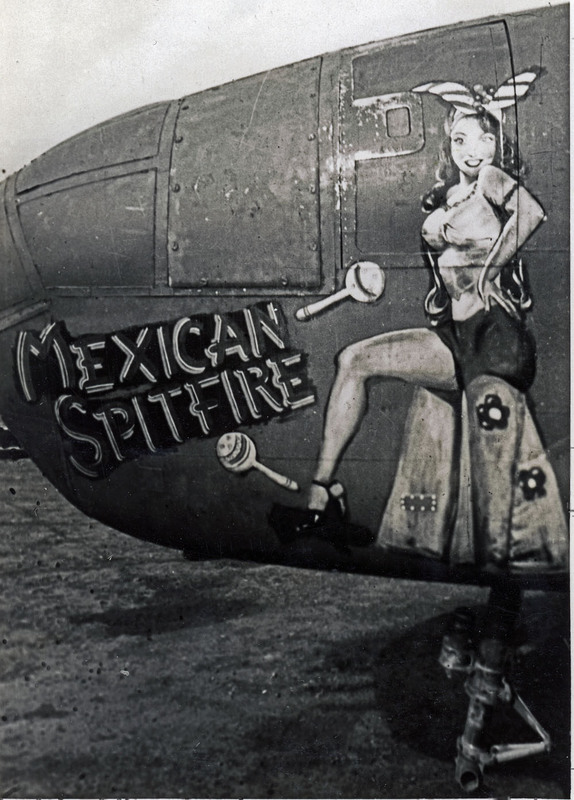 His B-25 nose art had the “Bats Out of Hell” artwork on it. The details of how and where he got shot down is in my book. Please order my book today. Wing Span: 67 ft. 6 in. ; Length: 53 ft.; Height: 16 ft. 9 in. 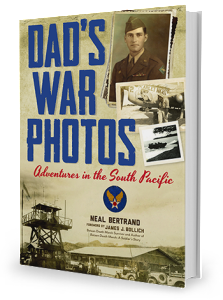 This fascinating book has 420 photos and 21 maps to help you follow my father’s trek through the South Pacific during World War Two. To get an autographed copy directly from the author, Neal Bertrand, click the “BUY NOW” button under the book cover in the sidebar of this page. Or click HERE to buy on Amazon.com. Or click HERE to buy from Barnes & Noble. 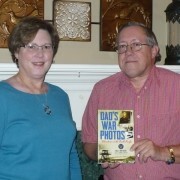 I was happy to find the site and will order your book. Jack was my great uncle, and I love to see anything I can find about him and his squadron. Hi Jack, thanks for commenting. Have you bought my book yet? Your dad’s battalion daily journal is available from the military. Did you get it? The info of how to get it is in my book. You’ll be able to trace his steps thru the war. Awesome! He did a great job. I love it.